Take a look at this tax season's new features! Many of these features are live in the site. Some will be available later this year. The biggest update is our new interface. We removed the Dashboard buttons, and replaced them with quick links. You'll see some links for: “Start New Filing,” “Print Out Existing Forms,” and “Submit Forms.” A navigation menu is available on the left side of the page. Last season, we heard that customers would like to save their imports before submitting. 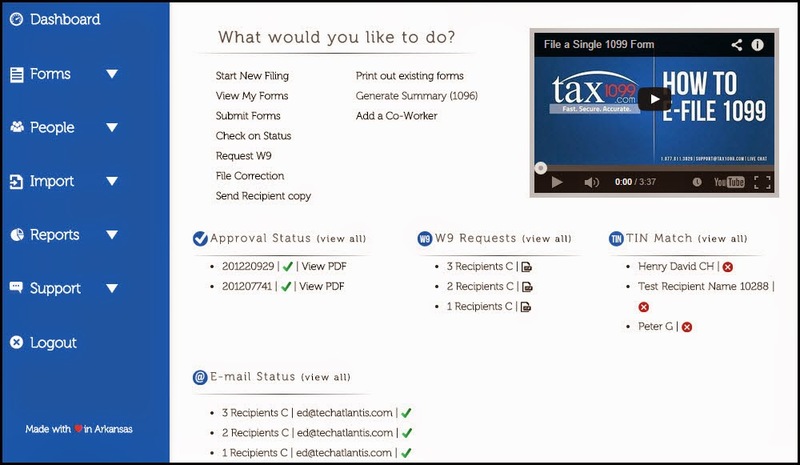 Many customers edit their forms within Tax1099.com. This season, we're introducing an import grid. You will be able to edit and save from this grid. This grid is available for any import, including: QuickBooks, Bill.com, Xero, and ZohoBooks. The import grid will give you the flexibility to start an import, edit the data, and return to the data at a later time. Both the USPS and e-mail delivery options are accessible from the check-out screen. This allows you to pick delivery methods while submitting forms. To enhance security, we've added two-factor authentication (TFA). This feature helps keep your and your clients’ data secure. When logging in, the site will ask for an additional security validation. You'll be asked if you would like to register the device as a safe device for future logins. If you select yes, the TFA will only be used once for that device. 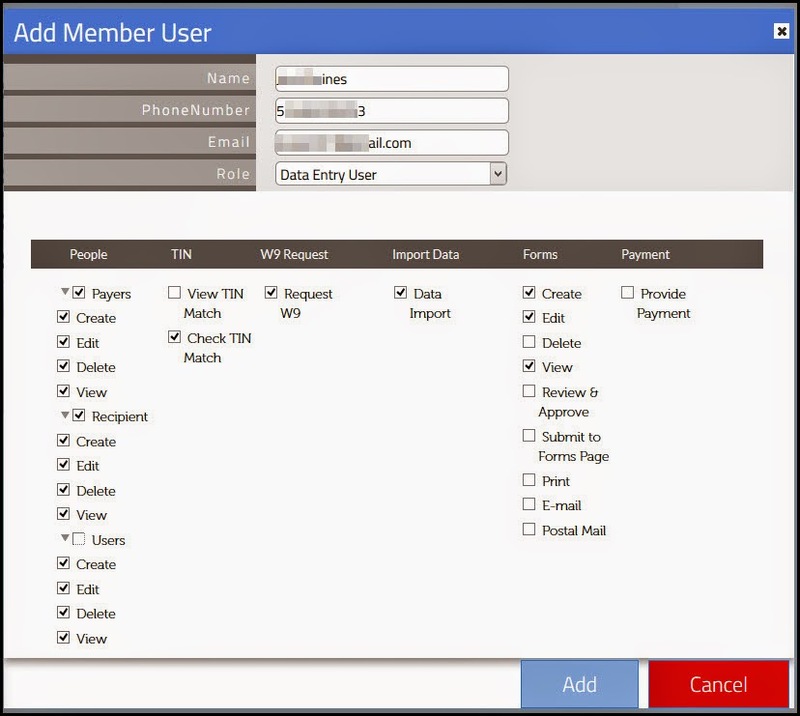 When creating an account, you can select the TFA. Logging in to an unrecognized device will start the TFA process. You will receive a code in a text message. Enter your username, password, and code to login. This second authentication helps keep your data secure. If an identity thief obtains your username and password, they would also need access to your phone for the code. Data security is vital to any business, and TFA increases the security of your tax data. While there is no form 1096 or W-3 to submit to the IRS when you e-File, many of our customers want one for their records. We have created a summary report for each payer that will allow you to see form 1096-type information. This report should not be filed with the IRS. With our e-File plus account, multiple users can access the same account. An audit trail allows you to view changes made in the system. Changes are tracked by user and date/time. We introduced a beta version of e-mail tracking last year. This year, you'll be able to see when your form has been e-mailed to the vendor. The tool allows you to see if the recipient received and opened the email, or if their email server rejected it. You'll be able to e-mail the recipient again, and even change the e-mail address. We now check your recipient addresses against the most current version of the USPS address database. Where there are discrepancies, we will update the address before sending the mail. In Forms Delivery Report, you'll be able to see when the mail has been processed, and when it has been sent by USPS. By January 1, form 1042-S will be available. This form is for reporting amounts paid to foreign vendors. We're offering this in response to our customers, who file both 1099 and 1042-S forms. Data Entry User – This person will be able to enter Payer, Recipient, and form information. Their entries will be reviewed and approved by another user. Review – This person will be able to edit Payers, Recipients, and Forms, and approve/reject forms. They may also be the user who submits forms once approved. You can also create a customer user -- A blank profile. The administrator can add any options to this user. We’ve made enormous changes in our infrastructure. We've increased our capacity in preparation for one of the busiest times of the year. We’ve transferred to a hosting service with on-demand scalability. As volume rises, so does the site’s ability to handle it. In addition, we've streamlined code and made some processing changes that will provide faster page loading times. This will also reduce the time required to complete processes. We love hearing our customers' feedback. The suggestions you send in make the site better for everyone. This year, we've applied many new features at your request. What else would you like to see? Comment with your suggestions, or send a suggestion to feedback@tax1099.com.